When Caroline was a baby, we had a monthly box subscription with a company that is no longer in business. I loved trying new products and toys I would otherwise never know about so, I figured I would give it a try with Ella. We ordered a Bluum Box and paid for six months in order to get a discount. We selected her age range and gender so they can customize accordingly. Our fist box came last week and we are excited to tell you all about it! The box is bright red and Ella seemed very interested in the box itself … just like every other kid, the packaging is always the best part. Inside there were four items. This is less than the boxes I have gotten in the past, but the items were decent in size so that made up for it. One thing that was not in the box was a description of each item and why it was chosen. This is a bummer for a few reasons. One, most boxes give you a discount code if you like the product and want to buy more, and two, sometimes there is a very good reason why the product is great for my kid that I would never have known about without the explanation. A Book: Bib on Bunny, a cut cardboard book with a finger puppet insert. Always fun for littles. A 360 Tooth Brush: Stage 5 Baby buddy. This is neat and we needed a baby tooth brush. It says age 4-24months. I noticed on the back they have some starter products for babies younger and go from stage 1-6. I would have preferred something more specific to a baby with only two teeth. This works for Ella’s two teeth, but can be hard to use with a wiggly baby. I would love to try their finger brush! See our full review of the 360 tooth brush and more here: Dental Care for my Girls. Magnetic Blocks: Tegu- Travel Pals Tugboat. This is super cool for ages zero-up, perfect for babies learning to use their hands, and will grow with them. Again, we got a Tugboat instead of something cute like a kitty, but other than that we loved this toy. Ella has already enjoyed pulling it all a part and chewing on the wood. Warm Feeding Plate: Plato by bbluv. This is interesting to say the least. It is a plate with three compartments for separating food. A silicon suction cup is on the bottom to keep it from sliding, but it does not stay very well. The idea is you pour in warm water that sits under the food keeping it warm. The water opening clips shut but worries me since it is not complicated to open. I could see a toddler getting it open and spilling hot water on their lap. The plate is nice and dishwasher safe, always a plus, but I just don’t see the need for something like this for a baby. We will likely use it as a normal plate and hope the suction helps keep the baby from spilling her food. I plan on testing out the warming part on my four year old since her food needs to stay warm longer than the baby's food right now. This product is not super practical for an eight-month-old baby. 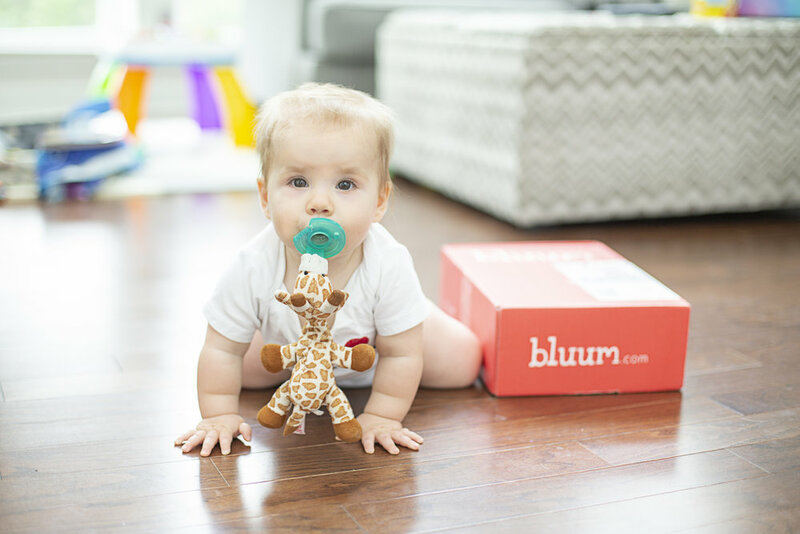 Overall we enjoyed the Bluum Box, but were not blown away. It is hard to say if this subscription is worth the money yet. If you are interested in giving the box a try, make sure to look for their latest coupons and offers. Subscription boxes are always running trial deals!